Passing down family stories from generation to generation is a nourishing aspect of human nature. It simultaneously grounds our immediate world and connects us with a larger world and perspective. Common objects often serve as the vessel for the memories and stories lived by previous “owners.” Within the clan, the object smiles as a reminder. To those outside the clan who look and wonder, it gives family members the chance to share their stories once more. Dan Yaccarino’s newest picture book shares the beauty of family stories, and how any object can become family gold when it becomes the vessel of family history and tradition. Even a little shovel, as honored in ALL THE WAY TO AMERICA: THE STORY OF A BIG ITALIAN FAMILY AND A LITTLE SHOVEL. Yaccarino’s text begins with his great-grandfather who was given a little shovel by his father so he could help in their garden. As a young man this great-grandfather sailed to America. But not without the little shovel and all the stories it held. In New York City the little shovel is used to measure flour and sugar in a bakery as new stories are added. Then used to measure nuts as the great-grandfather ventures out on his own with a peddlers cart. Generation after generation, the little shovel serves as a vital part of the young people’s lives and memories. In time, the little shovel is passed on to the author himself, Dan Yaccarino. Now its values are three-fold. It serves as the vessel for his family’s stories, provides the spark of this gem of a book, and is used as a little shovel by his son on their terrace garden. Where do writers find their ideas? Often the simplest of family heirlooms. 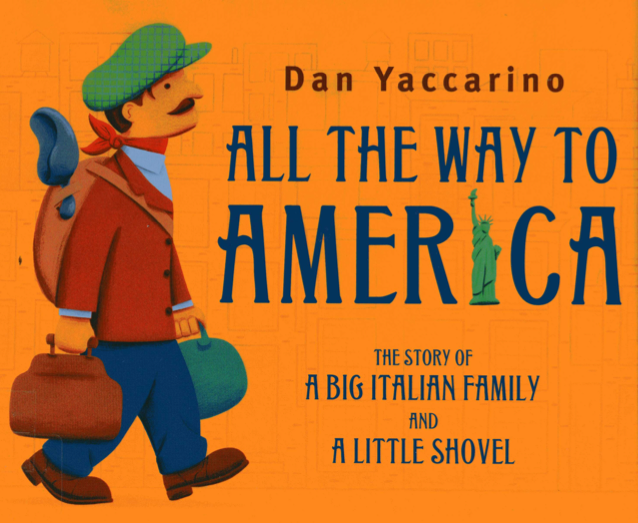 ALL THE WAY TO AMERICA: THE STORY OF A BIG ITALIAN FAMILY AND A LITTLE SHOVEL by Dan Yaccarino. Knopf, 2011. BLUE WILLOW by Doris Gates. Viking, 1940. MY NOAH’S ARK by M.B. Goffstein. Harper, 1978. THE STONE BOOK by Alan Garner. Collins, 1978. THIS IS THE BIRD by George Shannon. Illus. by David Soman. Houghton, 1997. 98 Years in 32 Pages? Each life is story of problems to solve. How one addresses these problems, or decides if it is even a genuine problem that needs to be solved is how people live their lives. In other words, the way one interacts with the world. The actions in their lives. Though these four picture book biographies on Georgia O’Keeffe are different in many ways, they all share the primary chords of this painter’s life. They share a focus on how she lived in the world. * The three primary landscapes of her life and work: Wisconsin prairie, the New York skyline, and the wide-open spaces of the southwest. * She was dedicated to her work and that work included how she lived in the world. Winter’s MY NAME IS GEORGIA is the only volume that makes a reference to O’Keeffe’s relationship with Alfred Stieglitz. And that is only a single, small image of a white haired man seen through a window of O’Keeffe’s Manhattan studio. Some might say an artist’s adult relationships have no place in a picture book biography. Other might say to leave out such information is a lesser or distorted representation. I urge you to look again. O’Keeffe’s relationship with Stieglitz was based in how she lived with the world, and that is the rich distillation these four books offer to children. 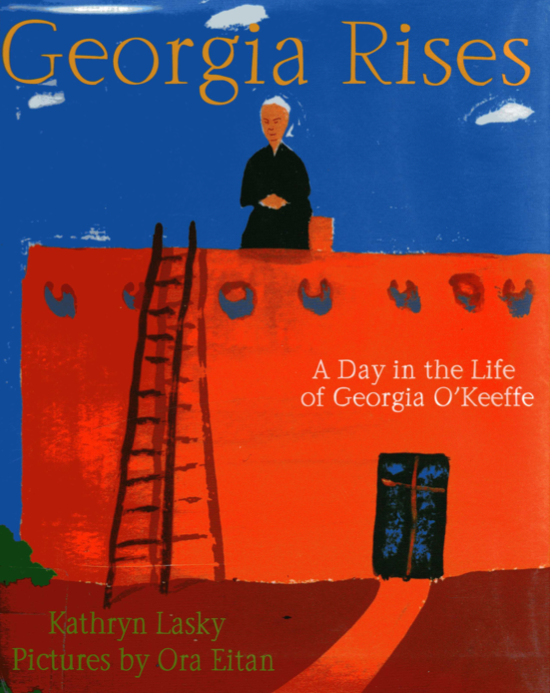 GEORGIA RISES: A DAY IN THE LIFE OF GEORGIA O’KEEFFE by Kathryn Lasky. Illus. by Ora Eitan. Farrar, 2009. 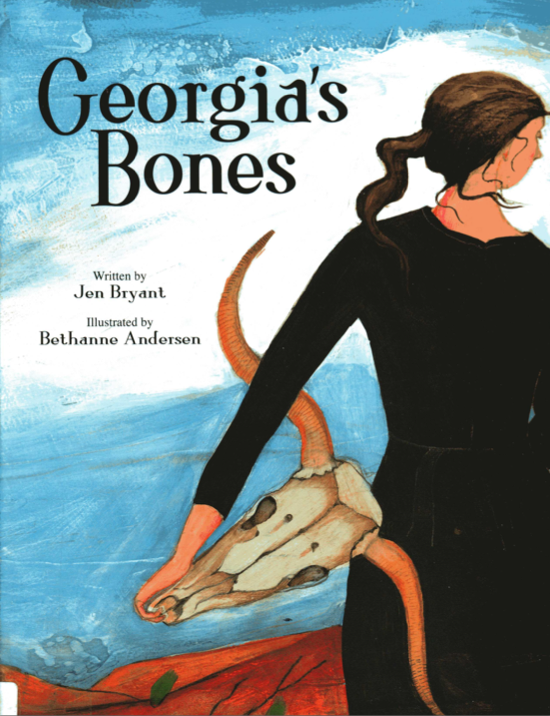 GEORGIA’S BONES by Jen Bryant. Illus. by Bethanne Andersen. Eerdmans, 2005. MY NAME IS GEORGIA by Jeannette Winter. Harcourt, 1998. 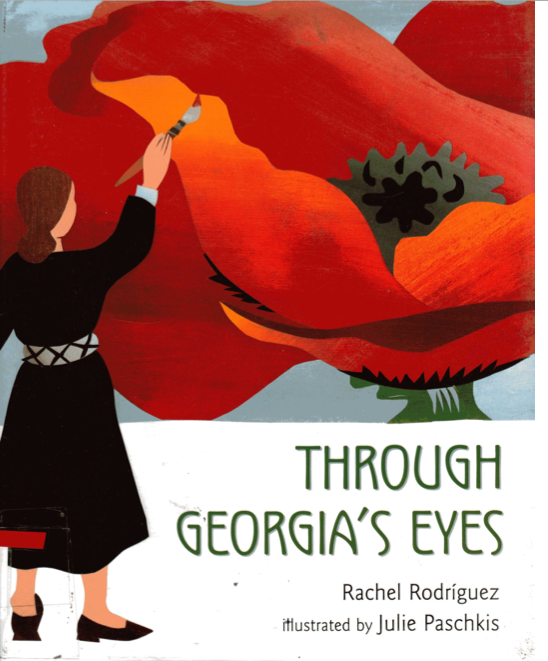 THROUGH GEORGIA’S EYES by Rachel Rodriguez. Illus. by Julie Paschkis. Holt, 2006.
an account of someone’s life written by someone else. • writing of such a type as a branch of literature. • a human life in its course : although their individual biographies are different, both are motivated by a similar ambition. By definition a biography is not required to stretch from cradle to grave. 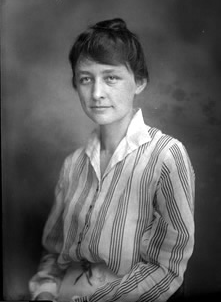 A biographer might elect to focus on only a portion of “a human life in its course.” Such is the case with our third and fourth picture biographies of Georgia O’Keeffe. In GEORGIA’S BONES Jen Bryant focuses on her subject’s early years: childhood through her initial experiences and paintings in New York and New Mexico. 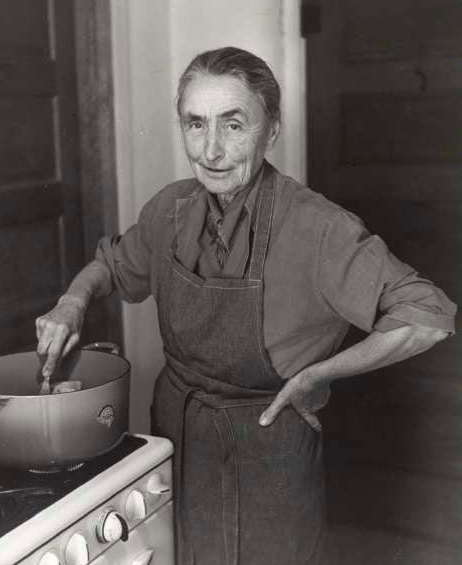 Kathryn Lasky’s GEORGIA RISES: A DAY IN THE LIFE OF GEORGIA O’KEEFFE describes a typical day in O’Keeffe’s life at an advanced age in New Mexico. While they focus on opposite ends of a life, both texts are reflective in tone. They also both attempt to slip inside O’Keeffe’s mind and thoughts, a style that is as much historical fiction as biography. Lasky’s “Author’s Note” actually identifies her manuscript as “historical fiction” because it blends events and chronology. 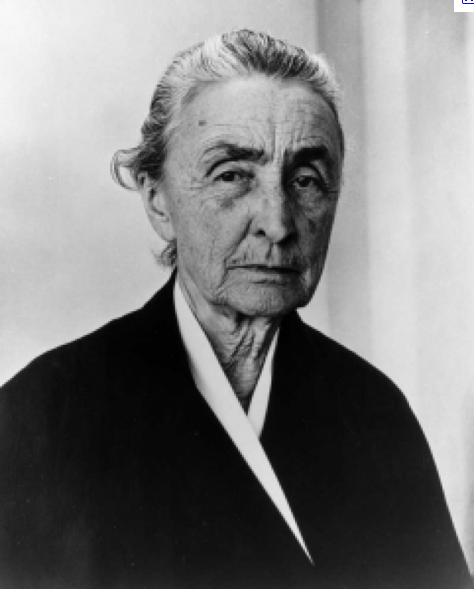 Bryant’s narrative voice blends comments by O’Keeffe herself with her own ponderings as to what O’Keeffe might have thought. “She didn’t know why they [bones] pleased her so. Each of these four picture books is as interested in how O’Keeffe lived her life as much or more than the chronology of her life. A chronology is merely a list of facts. The “who we are” and “how we live” creates the story. Next: Finding the primary chords in a life stretching 98 years. The biographer writing for adults has an all but endless number of decisions to make regarding scope, accuracy of source material, and what to include and what to leave out or (as the case may be) gloss over. Authors of picture book biographies have an even greater challenge. How to make all these decisions, and share a person’s life in only 32 pages. The spine of all biographies is what made the subject who they were, and how that shaped what they did. For the picture book writer this means a great deal of distillation. It is also a matter of perspective and angle much like Joel Meyerowitz and his varied photographs of the St. Louis arch. Neither photograph nor biography has to include everything in order to share an honest representation of the subject. Georgia O’Keeffe painted her giant flowers so people would “look close.” Four very different picture book biographies about O’Keeffe can help us “look close” at the options in scope and voice. 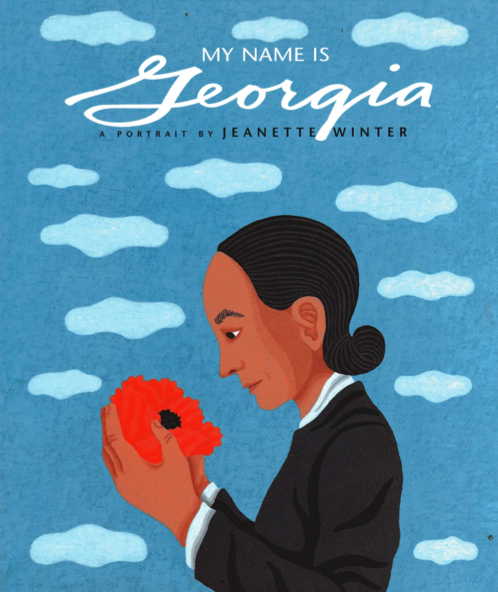 MY NAME IS GEORGIA by Jeanette Winter and THROUGH GEORGIA’S EYES by Rachel Rodriquez both begin with O’Keeffe’s birth in Wisconsin. 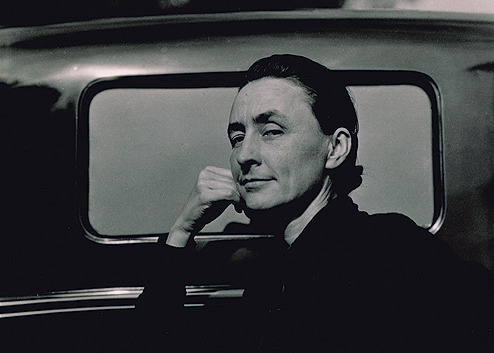 With place and time established, both authors identify young O’Keeffe as an outsider due to her love of solitude, colors, shapes, and drawing. It is here that Jen Bryant begins her biography, GEORGIA’S BONES. Still, each author is different in voice. I played alone for hours and hours and hours. in and out of Georgia’s mind. She studied them, and let them disappear. ‘Such common objects,’ said her brother. ‘Why do you bother?’ asked her sister. One story, three voices and styles: third person present tense, first person past tense, third person past tense. In only two or three double spreads each author has established the aspects of O’Keefe’s personality that shaped who she was, what she did, and who she became. “When Cultures Meet” by Patricia Wrightson in THROUGH FOLKLORE TO LITERATAURE edited by Maurice Saxby. IBBY Australia Publications, 1979.